Our arcade style twin dance machines bring the excitement of the arcades to your event and are a proven party favorite. 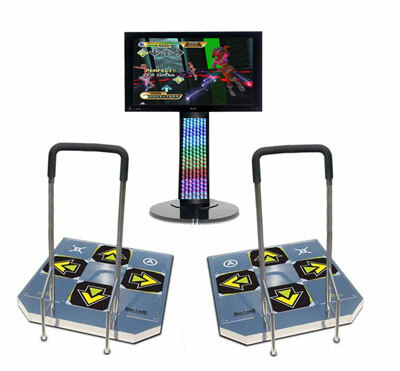 The dance machines feature stunning 3D graphics on the large 32" display. Tracks range from disco classics to recent chart hits and a selection of fast dance music. The units are portable and can be installed in most venues with ease. Complete with 2 arcade style metal dance pads with handrails, 32" TV and stand, coloured LED lighting effects bar and powerful PA system. Can be used by adults or children. This game is also fantastic fun for the spectators to watch, as they watch the players bust out their best dance moves! For Indoor or marquee use only. Requires standard power socket.